The Irish Tea will be held in the Hull House Foundation Headquarters. Here’s a great way to welcome spring: join the volunteers and docents at the Hull Family Home & Farmstead for their annual Irish Tea on Sunday, March 10. Guests are invited to wear their Irish green and Celtic jewelry as they gather over hot soup, favorite Irish treats, specialty sandwiches, trays full of delightful homemade sweets and – of course – tea, served in delicate china cups. The Irish Tea will be held in the Hull House Foundation Headquarters, located at 5962 Genesee St. in Lancaster. There will be two seating times, at 11 a.m. and 2 p.m. (Please note that due to space limitations, guests are asked to arrive no more than 15 minutes prior to your scheduled seating time.) The Historic Hull Family Home & Farmstead will also be open for tours and docents will be available to share information about the house and family. The cost to attend the Irish Tea is $25. Prepaid reservations are kindly requested as seating is limited and this event sells out quickly every year. For more information or to make reservations, call Barb at 741-7032 or Kathy at 579-2666. All proceeds benefit the restoration of the Hull Family Home & Farmstead. For more information, please visit www.hullfamilyhome.com. 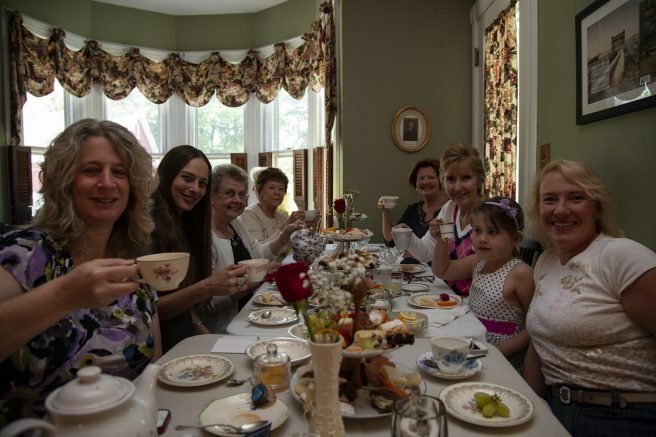 Be the first to comment on "Hull Family Home & Farmstead to host Irish Tea on March 10"